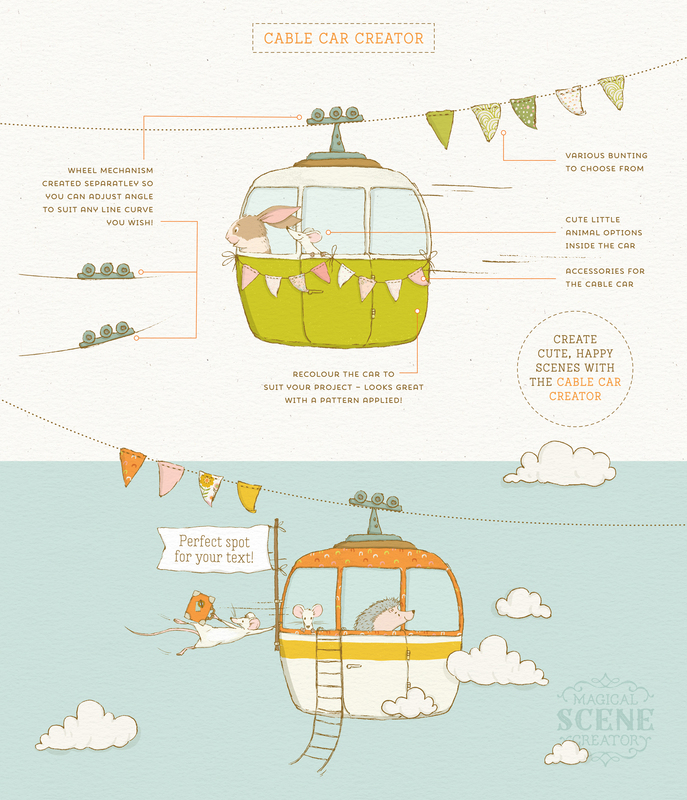 Create beautiful illustrated designs in minutes with the Magical Scene Creator! 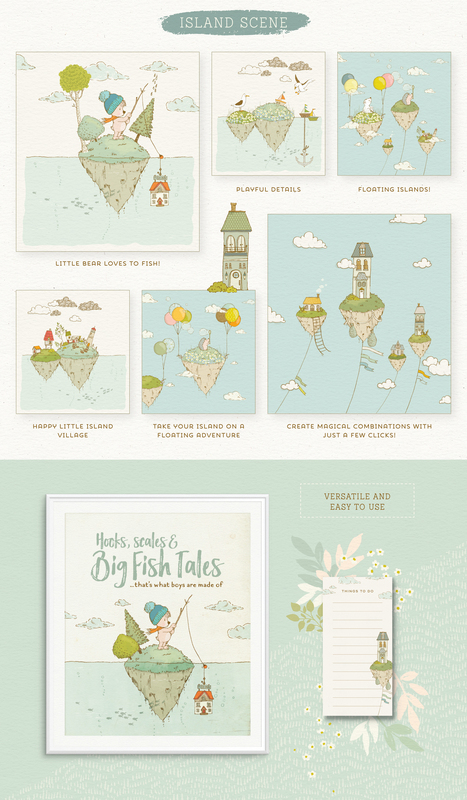 Perfect for greetings cards, books, posters, branding and so much more! Built to save you time and prevent those dreaded creative blocks, I’ve designed this kit to include scenes that will kick-start your creative process. Creating finished whimsical designs perfect for your next product or project will be a walk in the park! 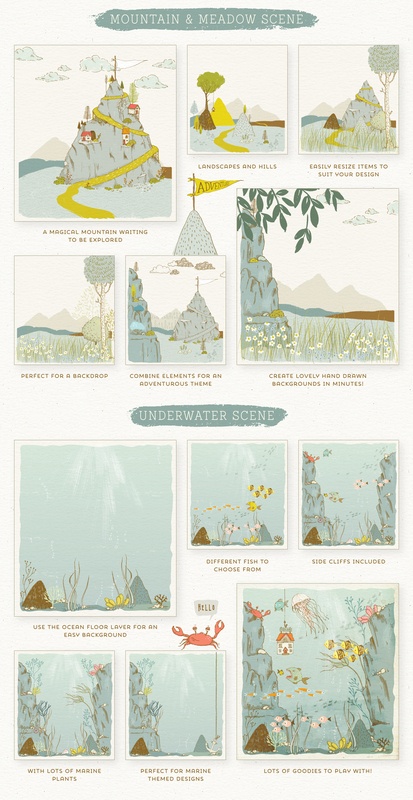 With a whopping 19 creators included plus loads more, you’ll be creating an enchanted underwater scene or an adventurous sky creation with just a few clicks. 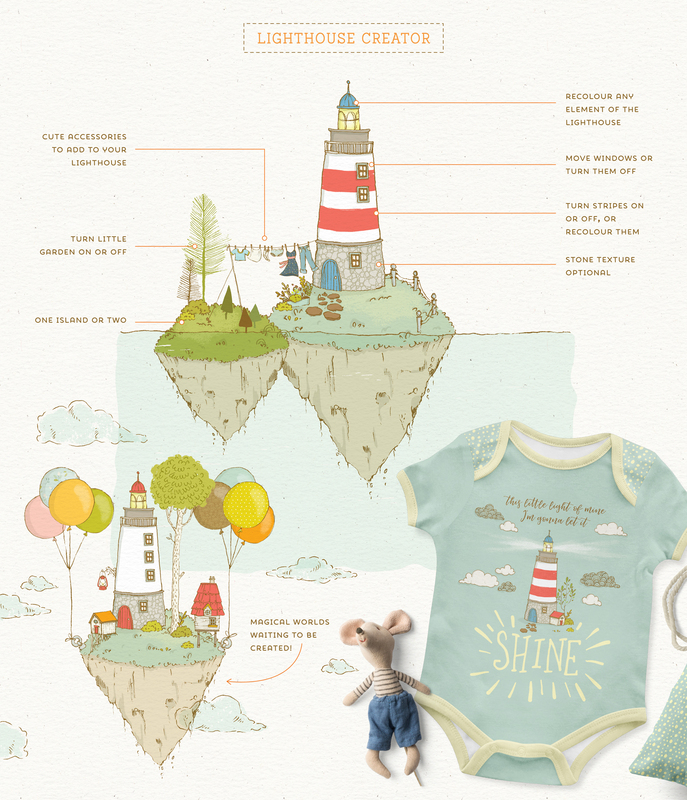 Each illustration is carefully named and well organised, simply turn layers on and off to customise your magical world! You have an online shop but often feel stuck when it comes to designing your next bestseller pillow or mug. You’ve been dreaming of self-publishing a children’s story you’ve written but hiring an illustrator is way out of your budget. You love creating special gifts for friends and family, and enjoy using graphics that help you learn more about the design software just by using them! You’re a designer who loves creating whimsical designs for clients but often don’t have the time to push out work you love. Whether you’re a professional or hobbyist you’ll love using this kit as you watch your magical world creations come to life with just a few clicks! Sugar Cookie is available as an .OTF desktop font only. It is featured in The Enormous, Authentically Illustrated All-in-One Toolbox but we decided to include it as an extra bonus! This product is exclusive to Design Cuts and has not been featured in a past deal. I’m a little confused about licensing. I want to buy the Magical Scene Creator (it looks so good). but I;m struggling with the idea of “Wider Original Design” where is the line drawn on this? How much would I need to add of other resources for it to be a Wider Design? From the example on your licence page it looks like separate elements from the same pack have been brought together to make the ‘safe’ result. I really love the pack and want to buy it (as soon as) but I;m worried about staying within the licencing terms. Sorry if this is an obvious question but I’ve always found licence language confusing. I was wondering if the illustrations are all vector, or what the highest possible resolution is, if not? Thanks for your comment Viktoria, and rest assured this is a great question! So when it comes to scene creators, you can definitely use your elements to create your own original scenes as your wider original design using just the Magical Scene Creator items. If however you are just wanting to use an elephant graphic from the scene creator as a book cover for example, you would need to add other elements, such as a background, textures, text and additional graphics of trees, clouds, birds etc. I have also just sent you an email so that I can go into a bit further detail about our licensing with you and can double check the files for you, so I hope that you really enjoy picking this one up for your collection :). I got the the Magical Scene creator in the first 48 hour launch deal, but I couldn’t get the link to download the bear bonus. How could I get it? 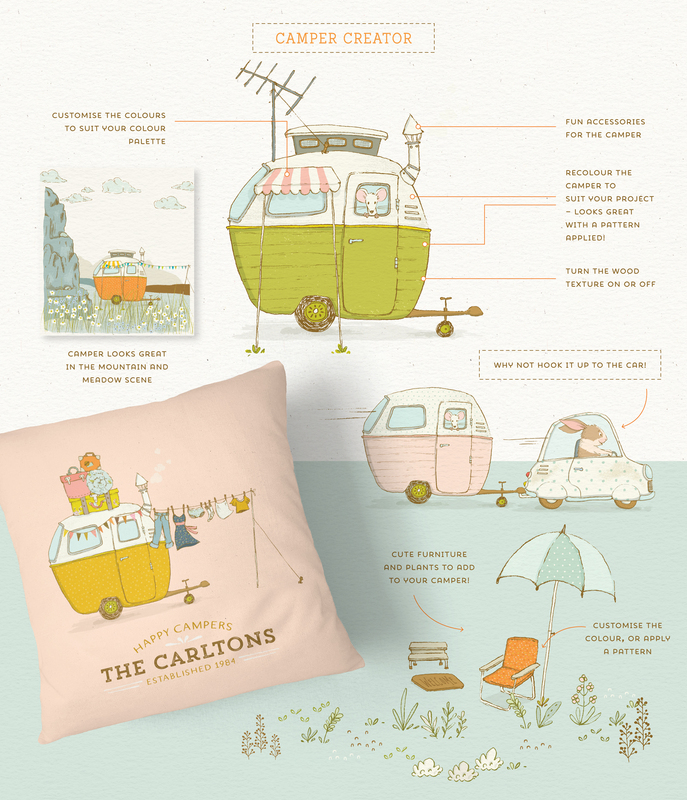 We’re so happy to hear that you love these illustrations Bel! I’m sorry to hear that you missed downloading your bonus bear scene from your account in time. I can certainly help and have just popped an email over to you so that you get working with this one straight away :). Finally getting around to using this kit. One thing though, I can’t locate the PSD files. According to the kit, these should be in Part 2, but all I’m seeing is PNGs and JPGs. I even re-downloaded it. At a loss. Looking for some help. Thanks so much for reaching out to us! I am so sorry to hear that you are experiencing difficulty locating your PSD files in your Magical Scene Creator Part 2 downloads- I can certainly help you with this! Lisa has included your layered PSD files in the folders; Photoshop CS4-CC > Magical Scene Creator, so I’m so sorry if you missed this in your downloads. I have also emailed you a screenshot to show you what I mean so I hope that you can get working with your PSD files without further delay :). I hope this helps and that you have great fun working with your new Magical Scene Creator! Thanks for getting back to me. I haven’t received any emails. Checked spam folder and nada, so if you can re-send that would be great. Re the folder you mention, all I am seeing is PNG files and a .DS_Store file. I’ve created a video of me going through the files, so you can see what I’m seeing. Happy to share this with you if you can provide an email address. Thank you os much for coming back to my comment and I am so sorry to hear that my emails have not reached you. I can see that you also emailed us directly so I hope that my reply reaches you and helps you get working with your files without further delay. I’m so sorry again for any delays caused Mena! 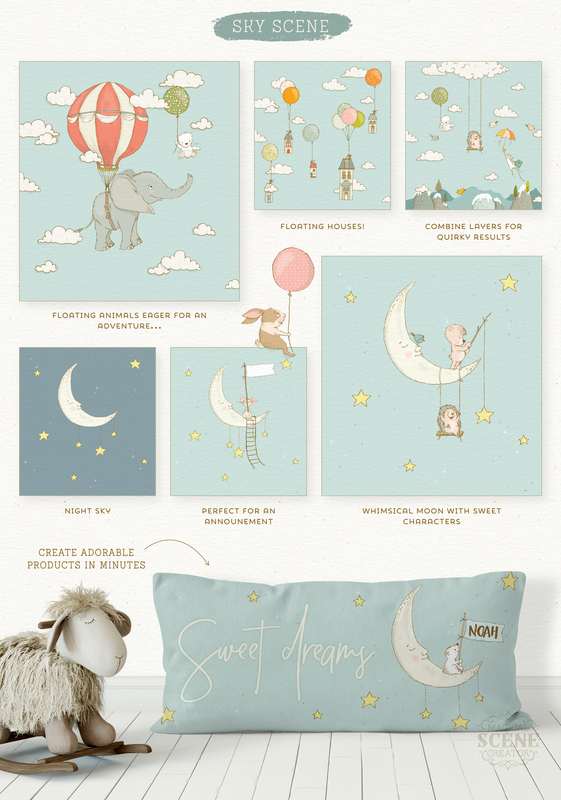 I want to buy the set and use it for printed wallpaper sheets for my friend’s nursery. I was wondering if the illustrations are all vector, or what the highest possible resolution is, if not? Thanks so much for commenting Nina, and it’s awesome to hear that you would like to use these for your wallpaper designs- that’s such a lovely idea! Thank you again and again for sharing your work with us. Thank you so much for your lovely comment Raquel and we know that Lisa will be so happy to hear your super kind words too! Yay we’re so glad to hear that you love it Claudette! Will this work the same way in photoshop elements? Thanks! As we do not work in PSE ourselves, I am unable to confirm if this pack will work in exactly the same way unfortunately but I am more than happy for you to trial out this pack. Hopefully you will find it useful for you, but if not please let us know within 30 days of your purchase and we would be happy to refund you in full! Hi, I love this, it’s so cute! I got the the Magical Scene creator in the first 48 hour launch deal that promised a bear bonus (as listed in my email order) but I couldn’t get the link to download the bear. Are you able to help please – I have not been able to work out why the link is broken. We’re so glad to hear that you love it and hope that you have great fun working with this one! I purchased this set within the first 48 hours and even downloaded it right away, but my files do not have the extra bear set. Is there anyway to get that? Thanks in advance. Thank you so much for your comment Suzanne and I’m so sorry to hear that you missed out on downloading your bonus bear scene whilst this was available in your account. From the sound of it you may have only just missed it so my sincerest apologies for any inconvenience caused! Rest assured I can certainly help to get you working with this one without further delay and have popped you an email! Thank you so much Annabel. You’re so welcome and I’m so glad that I could help! Hi! As always lovely work by Lisa Glanz! Bought the Magical Scene Creator within the first 48 hours, but have not yet downloaded the files and as it turns out I also no longer have access to the bonus bear scene… Could you help me out, please? Thanks! Thank you so much for reaching out to us and I’m so sorry for any inconvenience caused! I bought this adorable set within 48 hours, when there was a 50% discount. Where can I find my bonus file please?Thanks. I am so sorry to hear that you missed the Happy Bear bonus scene. Unfortunately this bonus was only available to download from your account within the first 48 hours of the Magical Scene Creator’s launch for our community who picked this product up at our 50% off Launch Special Deal, so my sincerest apologies for any confusion caused. I didn’t download the files w/in 48 hrs. I can’t find the bonus file. Please help. Beautiful pack, bought it as soon as it was available to purchase. Thank you so much for reaching out to us and we’re s sorry for any confusion caused! Rest assured I have sent you an email to help! Hi. I bought this a few days ago – it’s great! But I didn’t get the Bonus Pack. Can you help please? Hello, this pack is very beautiful, I bought it with the discount but I didn’t download the files. Today I proceeded to download them but I didn’t find the extra pack, could you help me please? Thanks for the email, I was able to download it. Yay! That’s great news and that’s really kind of you, i’m so pleased Annabel was able to help! Love this! Can someone please tell me if the PART 2 photoshop version contains PNGs? Thank you so much for reaching out to us and we’re so sorry for any confusion caused by the file types included in the Magical Scene Creator. Rest assured we always list the software compatibility of all of our products, as well as advising when our designers have included alternative file versions for any of these so my sincerest apologies if you missed this on the deal page. absolutely love this set! so versatile. Lisa brings so much sweetness to the world! just to let you know: I tested the files with Affinity Designer on my iPad Pro, and the .psd files open flawlessly. Switching layers on and off, moving, resizing – it all works like a charm. Hiya, Lisa and the DC Team! I just wanted to say thank you, so much, for this amazing product. I’ve been a follower of Julia for a long time now and have every single product released. These last few months have been pretty tough, but this product is just what I needed to get back into the swing of things. Each and every time you release a product, Lisa, I’m amazed that it’s even better than the previous item. I don’t know how you do it, but please continue! Thank you once again for such an amazing product! And, of course, the DC Team; thank you for always going above and beyond for all of us. We’re so sorry that you have been going through some tough times recently, all of us here at Team DC are sending you big hugs and our best wishes! We hope that you really enjoy creating with your new Magical Scene Creator Tammy and that you get lots of great use out of all of your new resources! Thank you so much for commenting and I’m so sorry to hear that you missed your Bonus Bear Scene. Unfortunately this bonus was only available to download from your account within the first 48 hours for our community who picked this product up at our 50% off Launch Special Deal, so my sincerest apologies for any confusion caused. I bought this set within 48 hours, when there was a 50% discount. And once downloaded the file! No bear there!! Thank you so much for confirming that you picked this one up at our Launch Special Deal Price. Unfortunately this file was actually only available to download from your account for the 48 hours so I’m so sorry that you were unable to download your bonus scene in this time. The great news however is that I have already sent you an email to help you get working with your bonus bear scene without further delay. My email may have pulled through into your spam folder so it may be worth double checking in there! I’m so sorry that my email is still not coming through, would you mind popping me a message directly at hello@designcuts.com and I can certainly help you further with this and double check if our email address for you is correct. Thank you so much for taking the time to leave us your feedback! We hope that you have great fun working with this one and happy designing! Hi Lisa, thank you so much for this, I love it, so excited about it. And it is so easy to use: My four year old twins have been creating scences together with me, we will have them printed on canvas for their rooms. You are incredibly talented. Thank you again for sharing your work!! I, too, had been interested in this bundle, but was confused by the licensing as explained in the FAQs section. So I emailed support as suggested. The response was simply a redirect to the FAQs page — which I had already said I did not understand. Sadly, the special ended without getting any clarity from Design Cuts, so no sale from me. I STILL don’t have an answer about the licensing… and please do not send me another email directing me to the FAQs page. Thank you so much for your comment and I am so sorry to hear that you did not find our website FAQ’s helpful. We find that a lot our community have found our FAQ support section a super convenient way to search popular queries regarding licensing and other areas so our sincerest apologies if you felt that your queries were not being answered from this and for any disappointment caused. Rest assured we are currently working on improving our Support section so your feedback is greatly appreciated Isak as this will help us ensure that we can improve our support section to improve our community’s experience. Rest assured I can certainly help you with your query further and you should find my reply in your inbox to help! I’d like to thank Lisa Glanz and the DesignCut team for bringing this pack to life! By far the most intriguing pack I have ever seen. Indeed it is magical! Kudos! I’m enjoying this pack very much! 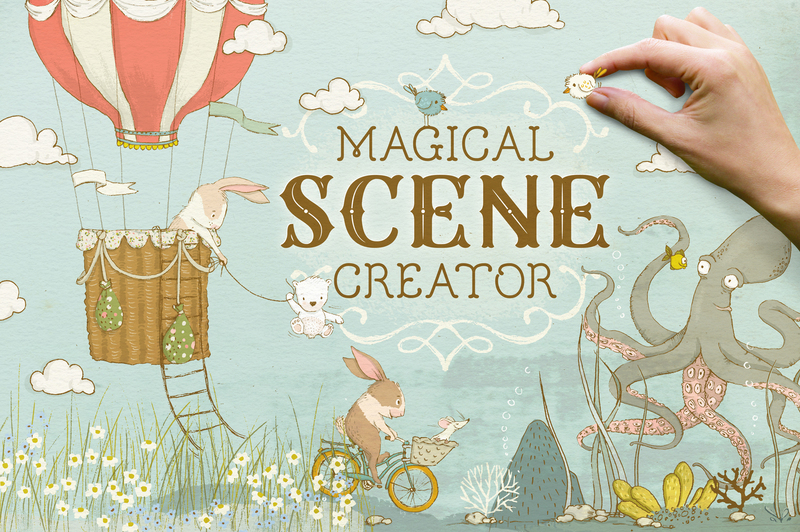 I’m so sorry to hear that you missed the Launch Special deal for the Magical Scene Creator. The deal was only available until Midnight (UK Time) as this first launched on Tuesday 6th November so our sincerest apologies for any disappointment caused! The good news is that you also have the option to build your own bundle and receive up to 50% off in our Marketplace so I hope that you are still able to pick this one up for your collection. What video software did you use to create the video with? LOVE THIS!!! I’m a bit confused by Licensing. Deal page states “great for branding” and shows flower shop logo, however specific licensing details for Vectors/Illustrations states that you cannot use a vector/illustration as a primary logo mark for an organization. Can you please explain? Hoping to purchase before deal ends! Oh no, I was just about to buy this, because the timer still said 3 hours left so I figured I wouldn’t rush down to get my card, and now the price has gone up!!! Dang it! Oh no we’re so sorry to hear that you missed this one! Our timer was counting down to Midnight UK time so our sincerest apologies for any confusion caused. Rest assured I have popped you an email to help! Love Love Lisa Glanz’s work!!! I’m a little confused about licensing. I want to buy the Magical Scene Creator (it looks so good). but I;m strugggling with the idea of “Wider Original Design” where is the line drawn on this? the first thing I am thinking of using it for is an animation I need to complete as part of a course. How much would I need to add of other resources for it to be a Wider Design? From the exmaple on your licence page it looks like separate elements from the same pack have been brought together to make the ‘safe’ result. Sorry if this is an obvious question but I;ve always found licence language confusing. Thank you so much for reaching out to us and I’m so sorry for any confusion caused, licensing can be a tricky subject to navigate so rest assured this is a great question and I can certainly help! I literally squealed when I saw this!!! Your work just makes me smile. Lisa, you’re an incredible talent, and thank you for sharing it this with us!! Is this just for IA and Photoshop? Or can it be used with PicMonkey and design software like that? Thanks! Thank you so much for your comment Shari. Unfortunately as Lisa has provided these in layered AI and PSD files, these will only be compatible with software that can support these files so I’m so sorry for any disappointment caused! Rest assured I have popped you over an email to help you with your query further! I am wondering if these would work in Photoshop Elements? I have seen others ask about other software programs but haven’t seen any ask about PSE… Would these designs be able to be used on POD sites? or to design greeting cards/posters etc for sale on websites? I am just a little confused about the license rights… Thanks in advance for any advice you can give me. 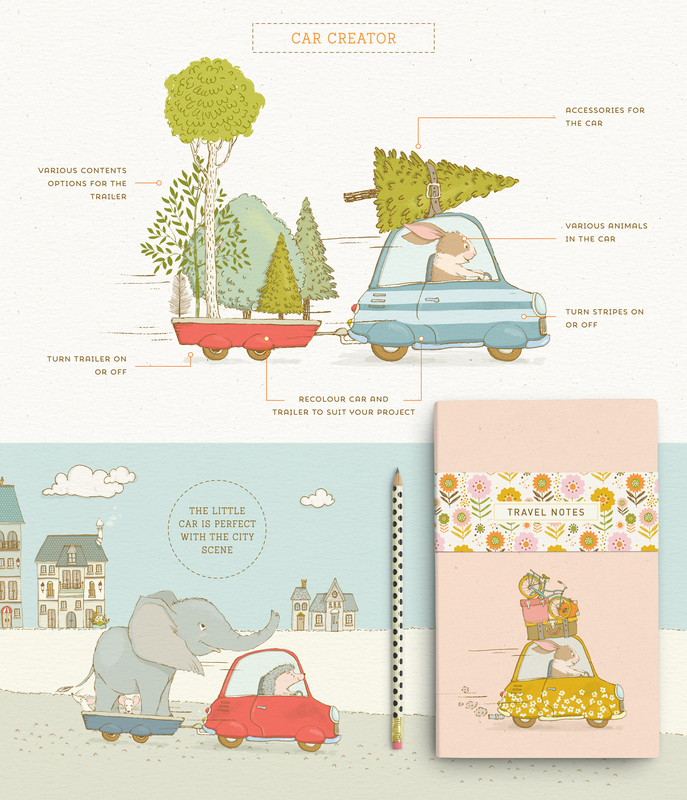 These are such adorable illustrations I feel like I want to make something with them!!! I don’t need this product! It does not fit in with the kind of work I need to do! But after a minutes hesitation, I bought it. Why? 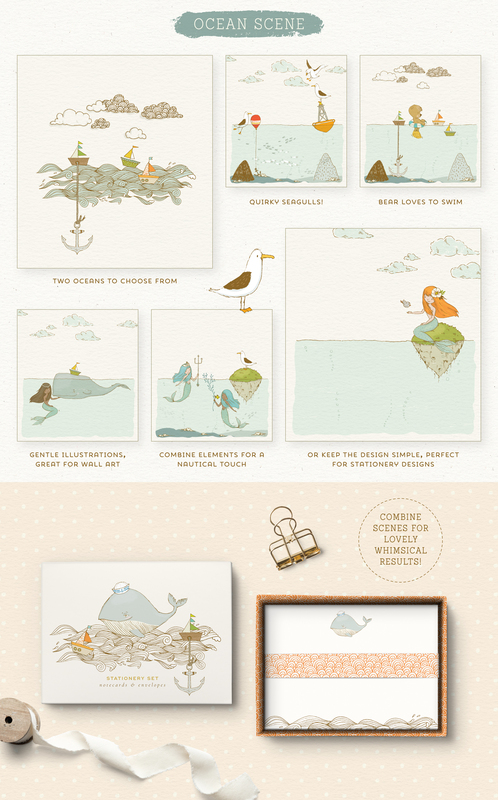 Because it’s brilliant, it’s cute, it’s whimsical! And I’m going to use it backwards! Have wanted to learn After Effects for the longest time, but without elements to inspire me, It’s difficult to get motivated. Now I have those with this package! Going to build an animated story and get After Effects under my belt. Thanks DesignCuts and Lisa for the inspiration! Thanks so much for your lovely comment, we’re so glad that you love it! From the moment I saw the first preview picture of this stunning deal, I knew I would get it. It is unbelievably cute and versatile, and I wish I could buy some extra time just to sit and play with all those lovely animals, items and scenes. Lisa is my all-time favorite illustrator, and she once again outdid herself. Thank you ever so much for this perfect deal! Hi this is a superb work!!! Can I please ask which software was used to create the animation presentation? Oh thank you so much Marthes! Oh my gosh! Such an intricate yet robust offering. So many possibilities with this. Good job on the incredibly talented hardwork that went into this. Beauty magic and sheer pleasure. What a wonderful set. I don’t think there are enough words to describe how this made me feel. You are a dream come true. Thank you Thank you Thank you!!! That is so kind of you Denise, there aren’t enough words for us to tell you how grateful we are for all the support, so thank you! Looks amazing Lisa! A question though: Is it right that I can’t just pick and choose some elements of the design to incorporate them in my own designed layout (with a lot of other elements) for a landing page on a website? Might change colors too. Your complete design has to remain ‘intact’? Or am I understanding the license incorrect? If I can’t use loose elements, it would be impossible for me to work with :’-( Thank you for the inspiration in any case! Can you use this on POD sites? Thank you so much for reaching out to us about our license. The great news is that you can certainly use the magical scene creator to create your own original designs to sell on P.O.D websites as long as you are selling a flattened design where the resources cannot be extracted by a third party. We’re sorry for any confusion caused by our license but rest assured, I have popped you over an email to help! Thank you very much! Blessings from Switzerland. Thank you so much for taking the time to leave us such a wonderful comment! This works i simply Amazing…Really One of a Kind! Is the Creator compatible with Affinity Designer or Photo? Thank you so much for leaving such an awesome comment! Is the Creator compatible with Affinity Designer or Affinity Photo? The question was asked Before, but not answered. Creator is Amazing…it would be great if could be used with Affinity. Thnks. I have Affinity Designer and was able to open both the photoshop files and the illustrator files. The photoshop files work perfectly but are obviously raster files and there is no way to convert them to vectors. The Illustrator files open and the main layer names work fine, however all the items under the main layer are names as groups and curves rather than the actual item names. Not impossible to work with but not exactly easy either. Thank you so much for your comment, we’re so glad that these work in Affinity Designer as well for you and we hope that you have lots of fun working with these! Incredible! Never ever seen something more beautiful than this! Thank you, Lisa, you’re INCREDIBLE GIFTED! I just can wait to start working with them! Aww, thank you so much Liliana that’s really kind of you! No regret I did it, the webinar was simply great! Lisa and Tom, thank you so much! I use Corel Draw. Is this compatible please? Thanks so much for your comment and I am so sorry to be the bearer of bad news, but Lisa has advised that this one is only compatible with Adobe Illustrator CS4+ and Adobe Photoshop CS4+ I am afraid! This is an amazing set! But I kinda wish it wasn’t so comprehensive coz I don’t know if I could find any elements (outside the kit) to combine it with – to keep in terms with the commercial licensing usage (if you know what I mean). Thanks so much for your comment and we’re so sorry for any confusion caused! Omgosh, so darling! 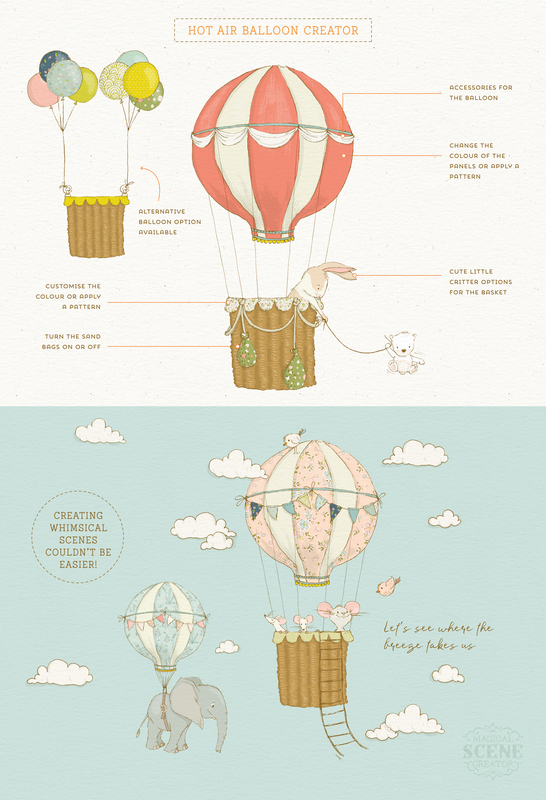 Lisa has such a beautifully whimsical imagination and the talent to match! Thank you so much! I am not even sure, what I am going to do with this… it’s so wonderfully cute. Yeah I said it “cute”…. been a rough few months, this will probably be the last thing I can do with you guys… It’s been a great pleasure, thank you. Thank you so much for taking the time to leave us a comment. 😀 we love this Tina, THANK YOU! Well, I didn’t think I needed this, but wow it’s so beautiful I simply had to get it. I am sure I will be able to create some magical worlds. Astounding work! Well done Lisa and DC. We can’t wait to see what you create and hope you’ll absolutely love working with this! What a gorgeous product, I’m excited to work with it. Thanks to the talented Lisa Glanz for her beautiful style. We’re super excited for you to work with it too Su so thank you for taking the time to leave us a comment! Oh my, this is absolutely precious and I can’t wait to play with it! So beautiful!! I can’t wait to get started….I have a million ideas! Lisa is amazingly talented!!! Irresistible! There is no way I can leave this page without putting it into my cart. My head is spinning with ideas! Lisa, you have outdone yourself! Absolutely magical. Do I just WANT and play around and stare at this? YES! Just adorable and so much details to make a huge variety of different scenes – I cannot resist, downloading already. And thank you for the discount! Hee-hee we love your thought process behind this Meike and hope you’ll love playing around with it! Ok, I’m just agog over this product! Lisa G, you’ve totally outdone yourself, and the tiny, whimsical creative touches are just outstandingly cool! Going to the tippy tippy top of my wishlist. Can’t wait to pick this one up! Wow, this package lives up to the hype. Great fun and beautiful imagery! We’re so glad you think so Stephen! And thank you for the kind words, it means so much to us and Lisa! LOVE LOVE LOVE THIS!!! But, before I bite (and I’ll prolly bite anyway), can you tell me if this can be used with CorelDRAW! ? I’ve used .ai files with CD! before, but wondering how this particular set would work…. We’d be right there with you Lara and couldn’t agree more! Ummm…this is ABSOLUTELY AMAZING! Not only is Lisa obviously an incredible artist, but the attention she puts towards making her scene creator so easy and fun to use is unsurpassed. I can’t wait to start making things! Thanks, Lisa and Design Cuts! Yet again the amazing Lisa Glanz takes it above and beyond with this product. The whimsical characters, the wonderful scenes, the flexibility, etc.. It makes it truly live up to its “Magical” name. Love it! That’s so kind of you, thank you so much, I know Lisa can’t quite believe the incredible response this has had so far! Thank you so much for this wonderful product. It’s so lovely – I can’t resist. Many thanks to Lisa Glanz and your team!!! Such a stunning set! Such imagination! Such talent! Thank you so much for taking the time to leave such a lovely comment Alfie, we really appreciate it! OMG! I’m speechless. Thank you so much. I love it. LOVE it!!!! THANK you SOOOOO much for the discount and the lovely bonus! Am looking forward to tomorrows live event! We’re so excited too AJ and can’t wait to see you all there! Gawwwd this is so darn adorable!!!! 😍 I don’t really need this and usually I’m not even into the cute thing but going to have to buy it anyway. How can I not? Everything about it is amazing. 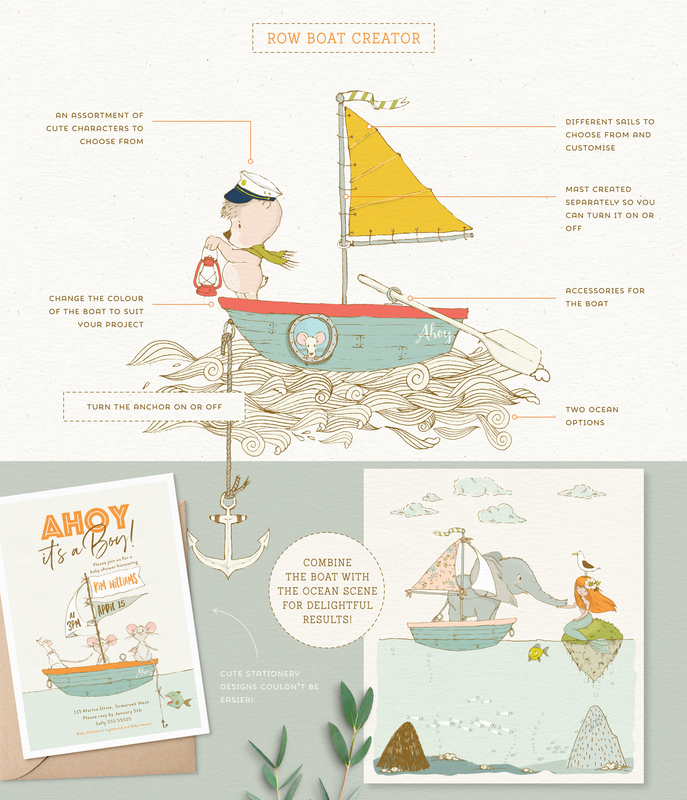 I can’t believe the work, detail and love that has gone into creating this – mind is blown! Lisa, thank you for inviting us to your magical world of whimsical comical creatures who create adventures and stories to share. I can’t wait to design products that capture the magic of these cutie characters! We can’t wait to see what you design either Claudia and thank you for leaving Lisa such a lovely comment! This is something incredible! Thank you for this opportunity! How many interesting things can be done !!! Wow – Amazing work Lisa!!! Oh WOW Lisa – this is spectacular! I’ve always loved your work and this is just beyond gorgeous – you are one talented lady! Thank you for sharing your magical world! And thank you DC for offering us great specials on amazing work such as this! 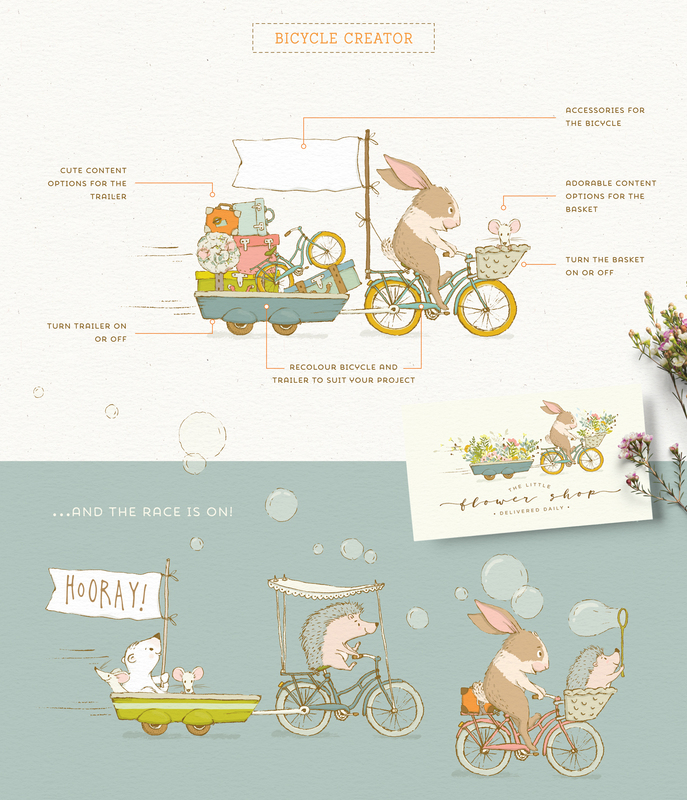 Congratulations to Lisa for creating this delightful and comprehensive package. I have a slow connection so I downloaded the Bonus first so I could start playing right away. So many options just in the Bear scene alone! Looking forward to weeks of creative play with the whole package. Thank you so much for picking this up Sharon and it’s amazing to hear that you’ve started playing with this right away! I can’t NOT get this! Sooo stinkin’ cute!! Thank you for all your hard and amazing work! Hee-hee that’s so great to hear Linda and we hope you’ll love working with it all! Has anyone tried this with Affinity Photo and/or Affinity Designer? Ok you guys. This is pure magic. Yay we’re so happy to hear that it felt like Christmas seeing this one Phil- we love the idea of us being Design Cuts elves to bring you new goodies for your design collection lol! And a very happy us from reading your lovely comment hee-hee! Thank you so much and we hope that you really enjoy working with these! Thank you so much for commenting, that is so nice of you to say! We hope that you get lots of great use out of your new resources! I bought this right away in no time. great product. I really like your illustrations and actually bought most of them. Yay we’re so glad to hear that this one was such an insta-buy for you Elfine! We hope that this pack makes an awesome addition to your collection 🙂 Happy designing! MAGICALICIOUS! I absolutely like everything about this package. Thank you Lisa Glanz for producing such a dynamic tool for all of us. Congratulations again Team DC!! This is definitely a 5-star special bundle. Time to hit ATC button so that I can start downloading this great work by Lisa. Happy designing Iskandar and thank you so much for all of your awesome support! Wow! You are soooo talented Lisa! Thank you so much for your lovely comment Anja, we’re so happy to hear that you love it! Awww we’re so glad that you think so Sharise, thank you so much!